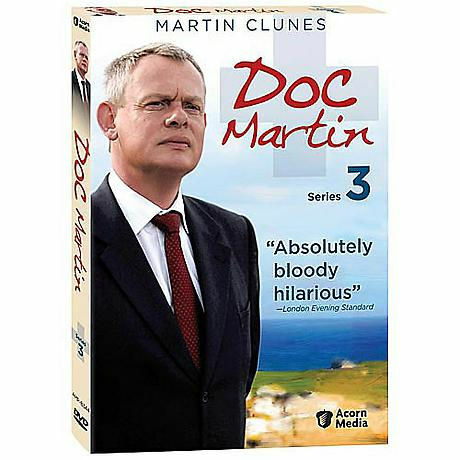 Dr. Martin Ellingham (Martin Clunes, Men Behaving Badly) is brilliant, dedicated, and highly efficient. He's also brusque, abrasive, and terrified of blood. Once a successful London surgeon, he's now a GP in the idyllic Cornish fishing village of Portwenn, where he's every bit as eccentric as the villagers he serves. With his terrible bedside manner, he has insulted everyone in town several times over. His relationship with Louisa (Caroline Catz, Murder in Suburbia) seems dead in the water. And he faces fresh challenges: The town's new constable has narcolepsy. Martin's beloved aunt Joan is aging. His receptionist, Pauline, is bored. He's also being pursued by a hypochondriac hotelier, much to Louisa's dismay. All of which make the good doctor even grumpier-and his antics even funnier. "The unlovable Doc Martin will win your heart" --Brattleboro (VT) Reformer. 7 episodes, approx 323 min. on 2 DVDs.